Here is a list that my wife Michele and I have created to share with other married business partner couples. We have been learning and practicing how to be good marriage partners, business partners, and writing partners, for the last 31+ years – and hopefully will continue for the rest of our lives. We consider the following advice to be very important to our successful business and marriage. We hope you will find it useful too. 1. You will learn several specific tips about how to create a great business partnership with your spouse. 2. You will learn how and why a marriage partnership is the same thing as a business partnership. 3. You will learn why you must put aside your ego, and consider the other spouse’s needs first. 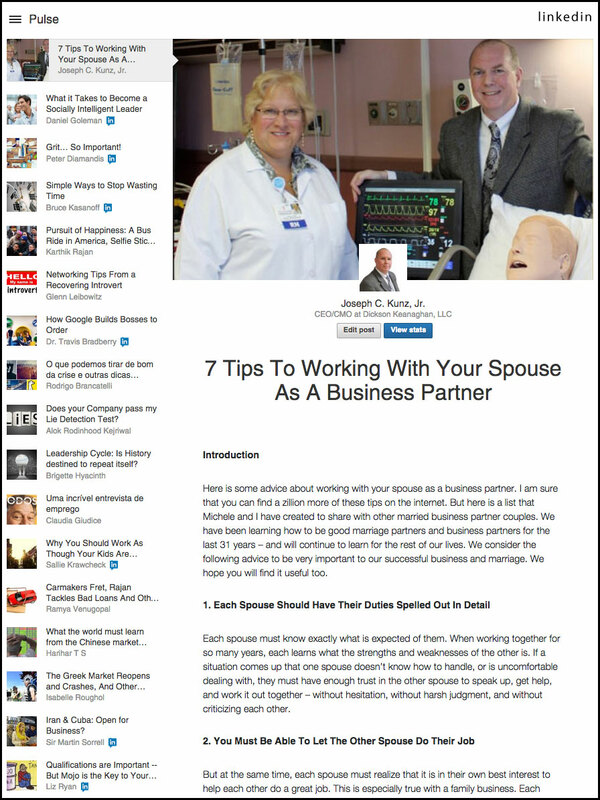 Here is some advice about working with your spouse as a business partner. I am sure that you can find a zillion more of these tips on the internet. But here is a list that my wife Michele and I have created to share with other married business partner couples. We have been learning and practicing how to be good marriage partners, business partners, and writing partners, for the last 31 years – and hopefully will continue for the rest of our lives. We consider the following advice to be very important to our successful business and marriage. We hope you will find it useful too. Each spouse must know exactly what is expected of them. When working together for so many years, each learns what the strengths, weaknesses, likes, and dislikes of the other is. If a situation comes up that one spouse doesn’t know how to handle, or is uncomfortable dealing with, they must have enough trust in the other spouse to speak up, ask for help, and work it out together – without hesitation, without harsh judgment, and without criticizing each other. 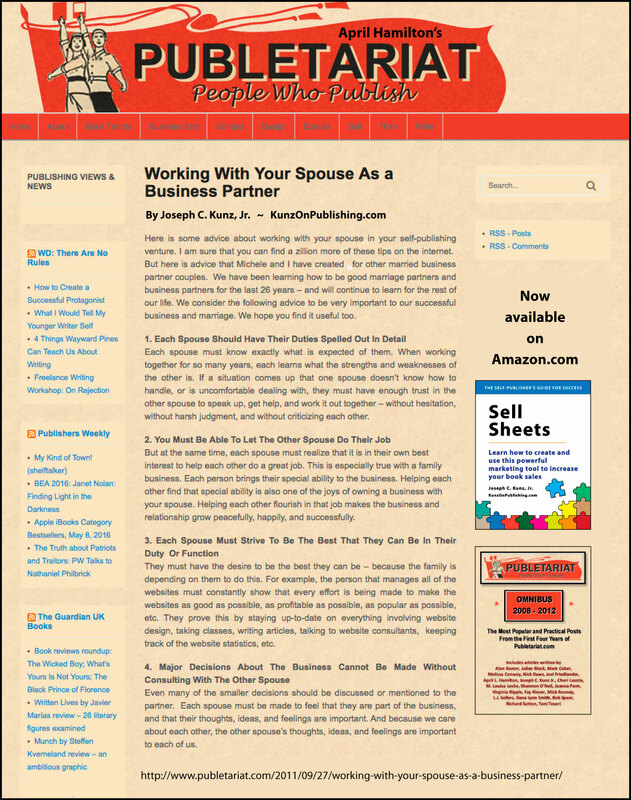 Publetariat.com – Working With Your Spouse As A Business Partner, By Joseph C. Kunz, Jr. But at the same time, each spouse must realize that it is in their own best interest to help each other do a great job. This is especially true with a family business. Each person brings their special abilities, knowledge, and experiences to the business and partnership. Helping each other find that special ability is also one of the joys of owning a business with your spouse. Helping each other flourish in that job makes the business and relationship grow peacefully, happily, and successfully. They must have the desire to be the best they can be – because the family is depending on them to do this. For example, the person that manages all of the websites must constantly show that every effort is being made to make the websites as good as possible, as profitable as possible, as popular as possible, etc. They prove this by staying up-to-date on everything involving website design, taking classes, writing articles, talking to website consultants (our kids), keeping track of the website statistics, etc. Even many of the smaller decisions should be discussed or mentioned to the partner. Each spouse must be made to feel that they are part of the business, and that their thoughts, ideas, and feelings are important. And because we care about each other, the other spouse’s thoughts, ideas, and feelings are important to each of us. Any heated discussions or disagreements that arise should be considered to be ended after a few minutes. Never go to bed angry over something without discussing it and defusing it. Most disagreements and arguments are not worth all the effort and time that gets wasted on them. Each must realized that they could be wrong, and need to listen to the other spouse. Many of these relationship advice lists that you can find on the internet tell you to keep your family responsibilities completely separate from your business responsibilities. In our case we can’t do that. We don’t want to do that. Our business is our life. Our business mission is our life mission. We also have bills to pay, and mouths to feed. Luckily, we are able to seamlessly combine our business responsibilities and family responsibilities. We take all of these responsibilities very seriously. In our case the cell phone, the computer, the internet, our reliance on each other, our team of business advisors and consultants, family members that are involved in our business, and our amazing team of employees, all help to make our business and business partnership successful. Finally, the most important thing to remember is that a business partnership is the same thing as a marriage. In order for it to survive and thrive, it needs trust, compromise, honesty, respect, and diplomacy. A sense-of-humor and a bit of playfulness don’t hurt either. These seven tips have been the key to keeping us together and helping us become successful in business and in marriage. We both know and understand that a relationship is a never-ending learning process. 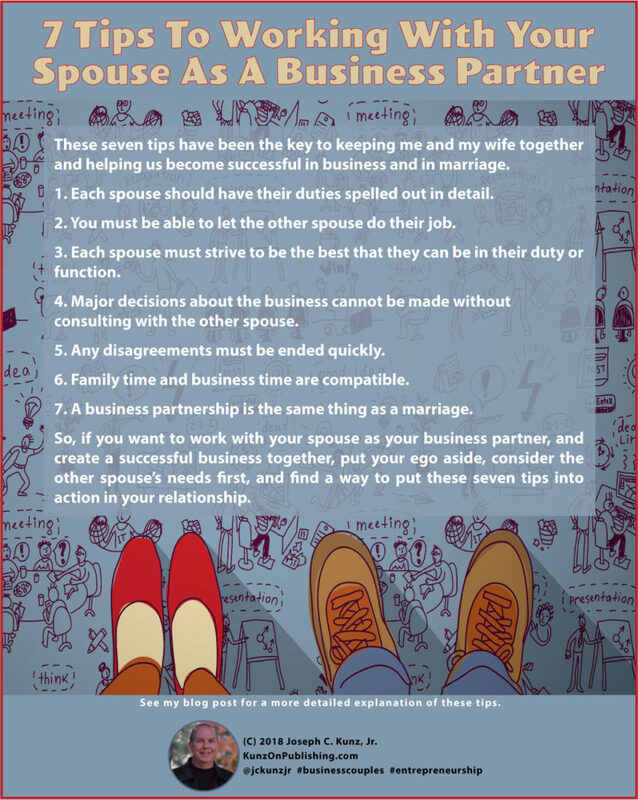 So, if you want to work with your spouse as your business partner, and create a successful business together, put your ego aside, consider the other spouse’s needs first, and find a way to put these seven tips into action in your relationship. 1. What do you feel are the benefits of being married to your business partner? 2. 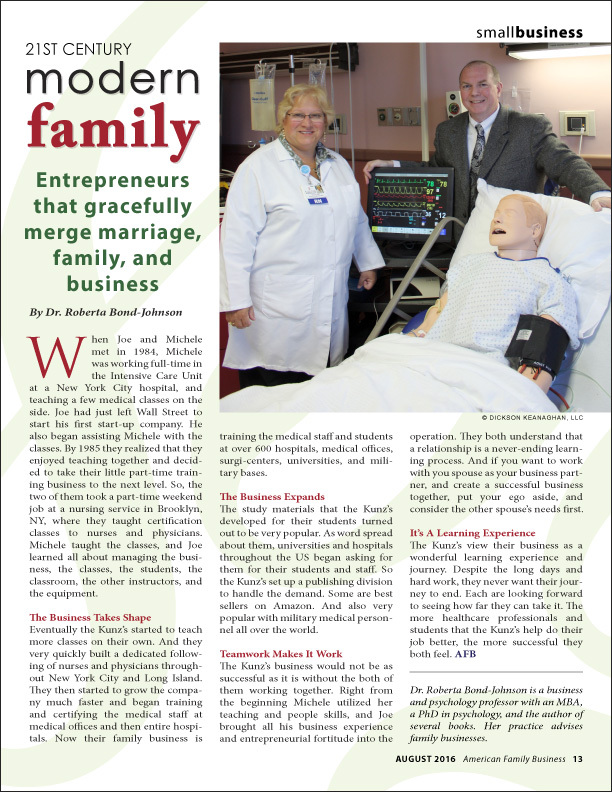 If you don’t believe married couples can be business partners, why not? This entry was posted in Business Model, Entrepreneurship, Management, Partnership, Podcast, Spouse, Start-Up and tagged business partnership, Entrepreneurship, family business, Joseph C. Kunz Jr., marriage partnership, Podcast, Small Business, spouse partners, Start-Up. Bookmark the permalink.